I’ve never been one for health food crazes. I’ve never ‘been on a diet’, I just try to avoid drive-thrus and eat my broccoli. A coworker of mine mentioned his family was trying to go gluten-free. I didn’t know what that meant, and while the all-knowing google has shed light on what gluten is, I still am not totally clear on why people avoid gluten unless they allergic to it—besides the fact that avoiding gluten means avoiding lots of carbs but let’s call a spade an Atkin’s diet spade. 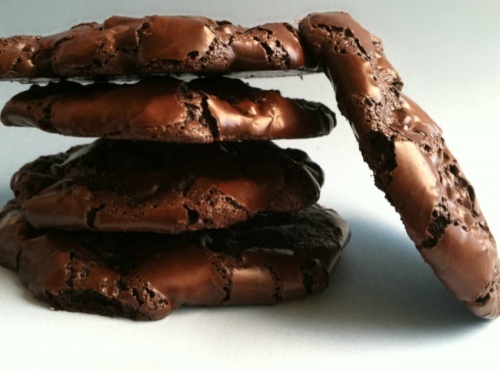 So of course that very same day I am perusing pinterest when I see these cookies and am stunned by their shiny, scrackly, chocolate goodness. I went to repin it for myself and realized underneath the picture and see it says “gluten free” and I thought “who wants their cookies to be—” ohhhhh. So I made these. For my coworker and his health kick. For myself and my sweet tooth. For the gluten sensitive. And for all those people out there who broke up with gluten because “it’s not you, it’s me”. This is less of a recipe and more of an idea. It’s simple and quick and—thanks to these wonderful store bought cookies—delicious. These are the cookies Oma uses in her famous holiday log and I bought them to use as a crust to a cappuccino cheesecake I never got around to making (YET!). They are the perfect size for these little treats. 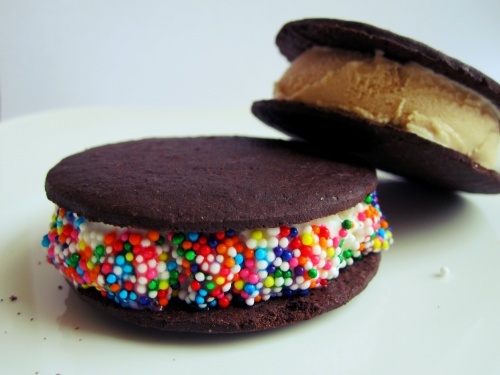 These will be the cutest, easiest ice cream sandwiches you will ever eat. And since you assemble them yourself, they are homemade, right?? I live two lives, one at work and one at home. I love to bake so I squeeze in new recipes, pictures, and posts anywhere I can–often to the detriment of my sleep. And so I guess you could say that my coworkers um…eat well. Birthdays in particular have taken a somewhat spoiled turn, as it’s an excuse for me to delve into the wonderful world of cake. The coworker this cake was made for, when asked what her favorite flavor of cake might be for no particular reason <cough cough> responded quickly “coconut”. I was expecting chocolate or vanilla….or any of those general categories of sweets that leads me in a general direction pretty easily. But I had never had a coconut cake before. I have had vanilla cake with vanilla icing and a layer of coconut on top. I’ve made banana cupcakes with brown butter icing and toasted coconut. So I was surprised by her response and excited for a fun and exciting new challenge. I used parts of two different recipes, one for the cake and one for it’s icing and filling recipe. I searched high and low for a cake that would cut perfectly—literally one of my favorite moments is cutting that first slice and finding out if its a dense, fine crumbed cake where the slice has smooth, flat sides or if it’s going to be a crumbly, hot mess. I’ve found that a picture is worth a thousand words, so I found a cake recipe with a picture of the most beautiful slice and went with it. 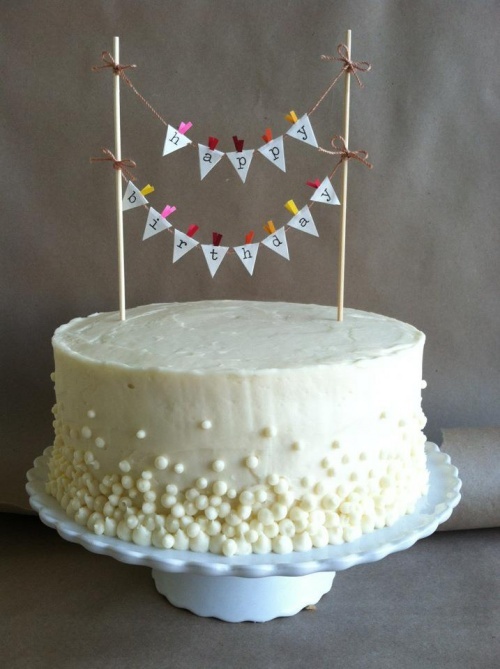 The final result was perfect—a slightly coconut flavored, delicate white cake with a thick, gooey coconut filling and creamy icing to tie it all together. And as strange as this may sound, I recommend it be served cold. It was so good that way—refreshing and wonderful. It might be because the filling has almost a pudding-type feel. Anyway you want it, try it out. It had a great balance so that those who love coconut are satisfied while others, who may not be the first in line to crack open a coconut and call it dinner, will love it too.